There is out a new special edition from Memphis Blue / Memphis Air Blue - again from the serie "Fly with ME". Natural American Spirit from Santa Fe Natural Tobacco Company is out with a new colour and with 3 mg tar and 0,4 mg nicotine. It is sold by Austria Tabak and the bar-code is 4043058 007597. 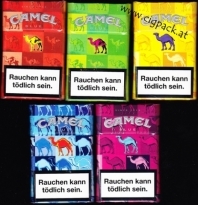 And there is also out a new Camel Colour edition with 5 different packs. L.D. is out in a new design in red, blue and yellow colour. For a limited time there is out Pepe Easy Green and Pepe Rich Green as Limited Edition as Tin-box. Camel Natural Flavor is out now in a third style - it's a White pack with 4 mg tar and 0,4 mg nicotine. The bar-code is 9036 8585. Walter Wolf is out as White Icon 100's with 8 mg tar and 0,7 mg nicotine - the bar-code is 3850 3085. Marlboro Gold brought out a Limited Edition in X-mas style. With this pack, I wish all the collectors, all friends and visitors of my homepage and their families a MERRY X-MAS and a HAPPY NEW YEAR!! There is out a Winter Edition for Chesterfield Red / Blue / Silver with each 4 different packs. And finally Philip Morris One is also out in new design.